If you’ve got a bigger job, don’t even think about hammering nails yourself. Whether you’re roofing, doing crown molding, or baseboards, you’ll be able to get the job done right the first time with a high-quality nailgun. Learn more about what that best nail guns are on the market. The framing and finishing combo kit and canvas bag is a powerful combination that is sure to be on your wish list for this holiday season. This powerful combination kit includes four Freemans most used pneumatic nailers that will help you with all of your framing and finishing need. This kit includes a framing nailer,a finish nailer the straight brand nailer as well as a narrow crown stapler. For organization and transportation, this kit also conveniently includes a rugged canvas carrying bag to keep all of your pieces in place. This kit is made and distributed in the USA to produce quality products that are tough and dependable is high-quality products, with only the finest customer service to make sure you were satisfied with your kit. Included in this kit is a PFR2190 21° 3 1/2 inch framing nailer this is adjustable in depth for a number of applications. Air filter/anti-dust Keeps the inside parts of the stool debris free. The 360°adjustable exhaust enables the user to direct air away from dust and debris. The no-mar tip eliminates any damage that may have been caused to the working surfaces. The oil free design and anti-dry fire mechanism reduces any damage that may occur in the internal components of this machine.This also includes a PFN156 415 gauge 2 1/2 inch 34° finish Nailer, PBR32Q 18-Gauge 1-1/4- Inch Straight Brad Nailer, and PST9032Q 18 -Gauge 1-1/4-inch Narrow Crown Stapler. Enjoy this kit and all of its components for the reasonable price. If you are looking to invest a little more in your next nail gun, than the Dewalt Brushless Dual Speed Nailer is the perfect choice. For $289.99, the Dewalt Brushless Dual Speed Nailer will speed up the nailing process on your next carpentry project. The brushless motor drives in nails that are between 2 inches to 3-1/2 inches long. Two operating modes allow you to use your nail gun in sequential mode for use of precision in placement, bump mode to provide maximum speed for a quick finish. 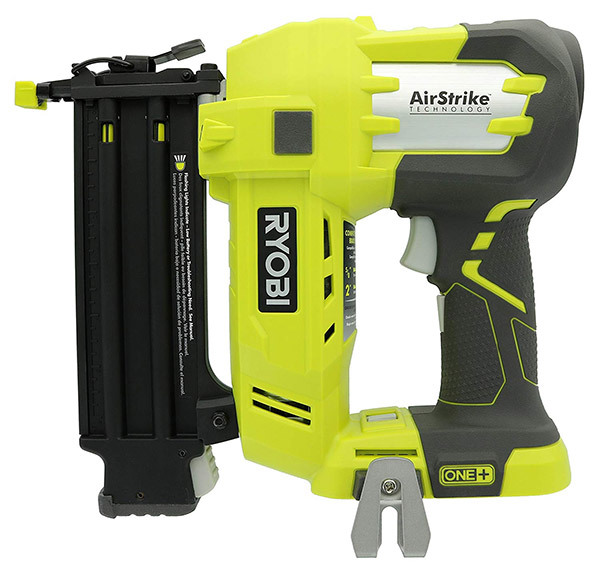 The dual speed option allows you to use the cordless nail gun with varying nail lengths. When it comes to using this nail gun, safety is number one. That is why there is a trigger lock to disable the trigger when you are not using the nail gun. The top cap is impact resistant as well as removable. This offers peace of mind and ease when trouble shooting your machine, to remove jammed nails from the nail gun, simply adjust the nose cap to access the nails. Take this heavy-duty nail gun on all of your tough jobsites. Weighing 7.7 lbs., this nail gun can withstand even the toughest jobs. But just in case it can’t handle the toughest job, there is a 3-year warranty to protect your nail gun. This convenient cordless power tool has a strong power that can be compared to some other mailers that are gas powered. You can be confident that whether you need to install roofing tiles, reinforce joints, or perform any other nailing job, you will be able to accomplish it with the Ryobi P320. A single charge of 4-amp hour battery from the One+ system will have your nail gunfire up to 700 nails up to a length of 50ml long. The onboard dial allows you to adjust the depth of your nails so you don’t have to think about using any extra tools. Don’t miss any details in you work with the built-in LED lighting. Keep this nail gun with you on the job site with the attached belt clip. Enjoy this Cordless Nail gun for the reasonable price. In this article, you’ve learned about the benefits behind using a quality nailgun. When operating a nailgun, it’s critical to abide by all safety measures and avoid dry-firing to further the life of your nailgun.